On average legal services employees in DC make about $166,000 a year, earning even more than their counterparts in New York and Boston – and employees at DC law firms are more likely to be married to each other than in any other state. In this post we look at average annual pay for employees in the legal services industry in the District compared to other parts of the nation. As the seat of the Federal Government and the Supreme Court, the importance of the legal sector in the District’s economy is not surprising, but other places like New York, Boston, Chicago, and San Francisco would seemingly offer stiff competition to the District’s white shoe firms in terms of average pay. 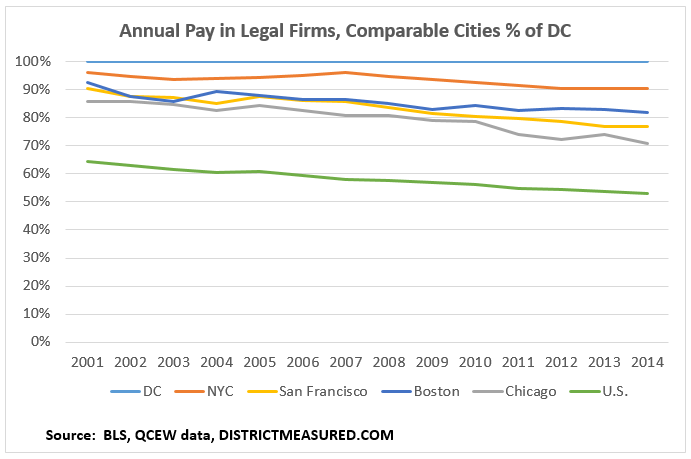 Law firm employees in the District earn more on average than their counterparts in other comparable cities and considerably more than the national average. 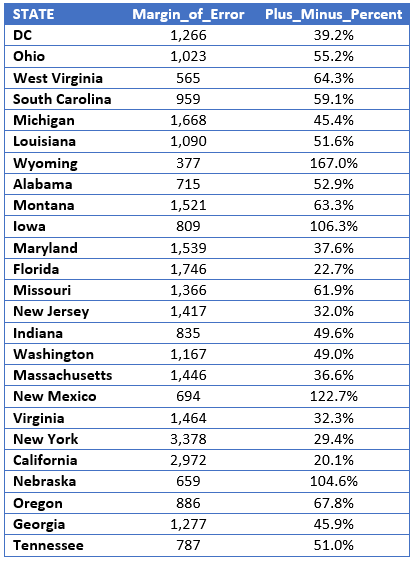 An employee in legal services in DC earned about $166,000 in 2014- nearly $15,000 higher than in New York and almost double the average pay for the nation as a whole. 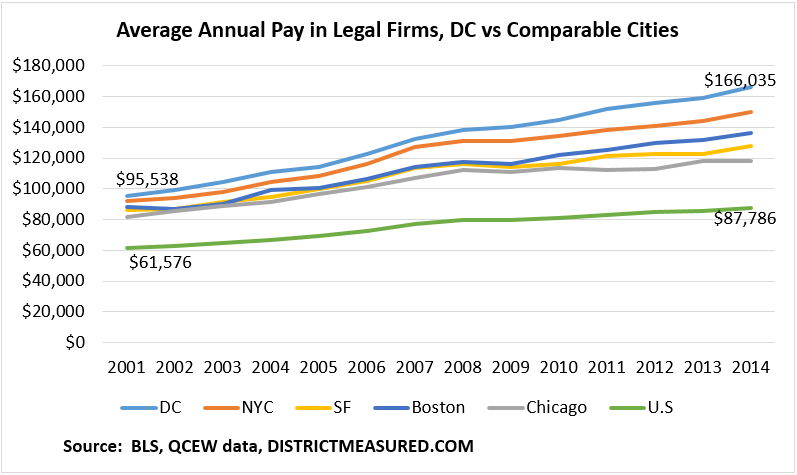 Interestingly the pay gap between DC and the comparable cities has widened since 2001. New York had closed in on the gap at the height of the stock market boom in 2007, likely due to a larger share of M&A related work but since then the gap has widened. Legal services employees in San Francisco and in Chicago have seen the gap widen from less than 5 percent in 2001 to over ten percent in 2014. In all these cities average annual pay is both far higher than the overall average and has grown at a far faster rate. For DC workers the overall average annual pay was $85,877 in 2014. Given the high pay that workers in legal services earn, as a follow up question, we wondered how many lawyers are married to other lawyers. DC again topped the list with 16 percent compared to a national average of about 8 percent for all States. Considering that lawyers account for about 3 percent of all occupations in DC, this suggests a non-random matching pattern. There is an interesting body of research on whether and why people marry within their same economic background or occupation and whether this leads to greater income inequality. If high income earners have a higher tendency to partner with similarly high paying earners then income disparity can be exacerbated compared to the opposite situation where high income earners partner with low income earners. The former is referred to as assortative mating while the later is referred to as disassortative mating. A a study by Jeremy Greenwod, Nezih Guner, Georgi Kocharkov and Cezar Santos on assortative mating confirms, at least nationally, an increase in assortative mating and a resulting increase in income inequality. The study can be found here. A recent study by Hani Mansour and Terra McKinnish, focuses on the role that preferences and “search costs” (the notion that meeting opportunities play a substantial role) have in dating decisions. Here is a link to the study.